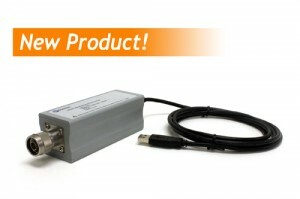 Parsippany, New Jersey, USA – March 20, 2013 – Boonton, a Wireless Telecom Group company (NYSE: WTT), has added a new platform to its industry standard power meter line, the new 55 Series Wideband USB power sensors. The new line enables high performance, real-time testing of wideband signals up to 40 GHz. Boonton’s innovative Real-Time Power ProcessingTM eliminates the acquisition latency associated with traditional peak power meters and sensors, yielding lightning-fast performance in a brand new USB platform. It is ideal for laboratory or field use, for wireless and telecom signals or radar work. “Advanced modulation schemes and broadband signals created in pursuit of more bandwidth efficient systems have left engineers dealing with complicated waveforms,” says Murat Eron, Vice President of Engineering at Wireless Telecom Group.